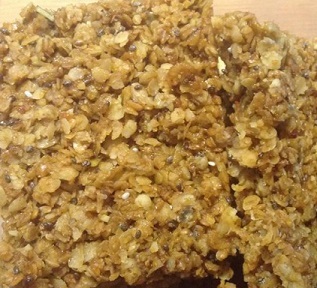 Because it’s the weekend and we all need a bit of comfort food, here is my latest flapjack creation recipe. It’s packed with pumpkin seeds, sunflower seeds, goji berries, linseeds and chia seeds. Sunflower seed, pumpkin seed, goji berry, chia seed and linseed flapjacks. Totally gluten, dairy, soya and nut free. This recipe is so brilliant because it doesn’t require any creaming of sugar and fat, you simply melt the wet ingredients in a pan, then mix in your oats. First put the pure spread, sugar and mollasses into the pan and heat on a low temperature until the sugar has melted. Mix with a wooden spoon until you have completely coated the oats. Spead the mixture into the lined tins and press it down and into each corner. Score with a knife while it’s still hot then leave to cool. And enjoy! – Cut into pieces once cool and store in an airtight container. I absolutely love flapjacks and homemade ones are always so much more tasty than shop bought. You can experiment with adding dried fruit, chopped dates and prunes work really well with pumpkin seeds. Using chia seeds is so much fun. They start out like little tiny black seeds but when they’re cooked they become burnished and shine like little silver, grey marbled jewels. They are also really good for you, one of those new superfoods. Shame you can’t see the properly in this photo. My bad photography. Using blackstrap mollasses is also fantastic in flapjacks. It’s like black treacle and is also a source of calcium. 100g contains 50% of your recommended daily allowance of calcium so use it in baking, mix it into your porridge and enjoy the beneficial nutients of sugar cane. It’s natural, unsulphured and much better than white and brown sugar. 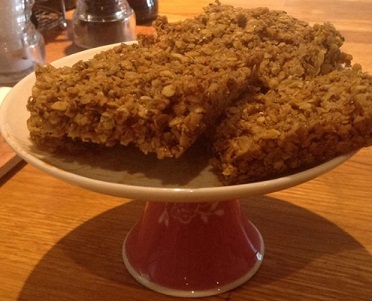 These flapjacks are so tasty and pretty healthy as a naughty snack. They also have the added benefit for people with allergies because they are gluten, dairy, soya and nut free, but certainly not taste free.